The training your pet receives is arguably the most important factor to a successful installation. Not only do pets learn boundaries faster with GentleSteps™ , but the training is also fun. The end result is a happier, healthier, safely contained pet! Dog Fence Ontario is a licensed and trained Pet Stop® dealer. First, we use Google Earth to visualize and design your solution. Next, we professionally-install jacketed copper wire to create your pet’s boundaries . 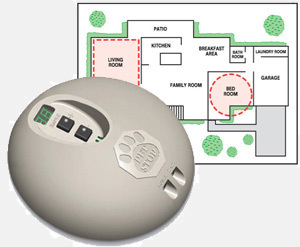 Then, we install a transmitter in your garage, or anywhere on your property that has an electrical outlet, to send out a radio signal through the wire to the receiver collar that is worn by your pet. When he approaches the boundary limit, he receives an audible warning followed by a harmless but startling correction if he doesn’t turn back. Each dog will have their own personal settings to ensure comfort and safety. The training your pet receives is arguably the most important factor to a successful installation. If your pet is not trained properly, they may end up confused. That’s why we train using the Pet Stop® exclusive GentleSteps™ training method. Unlike other pet fence systems, ours uses barely perceptible levels of collar stimulation – just a tickle – during the initial training phase. The GentleSteps™ training method is extremely gentle and uses low levels of correction with positive reinforcement. Not only do pets learn boundaries faster with GentleSteps™, but the training is also fun. The end result is a happier, healthier, safely contained pet! Full Perimeter: Encloses the entire yard, allowing your pet to move around freely. Hour Glass: Separates front and back yard into two zones and allows your dog access to the front yard through the house or garage by invitation only. Horseshoe: Encloses either the front or back yard with a double-loop figure. Indoor Solutions: Keeps pets out of certain areas inside the home and can also be used to keep dog from exiting out the front door. Great for keeping cats off of nice furniture or dogs out of the garbage can. Have any Questions that haven’t been answered?